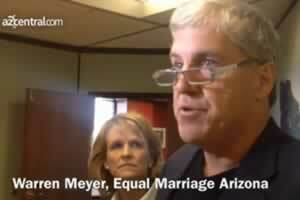 Concerns from leading LGBT advocates have stalled an effort to repeal Arizona's gay marriage ban. According to the Arizona Capitol Times, Equal Marriage Arizona has set aside for now its campaign to repeal Arizona's 2008 voter-approved constitutional amendment defining marriage as a heterosexual union. The ballot initiative was announced in June and paperwork was filed by Phoenix businessman Warren Meyer and retired attorney Erin Ogletree Simpson, chairwoman of the Arizona chapter of the Log Cabin Republicans. Gay activists, however, have questioned the campaign's timing and the motives of Tim Mooney, who is behind the Arizona effort and a similar campaign in Florida, titled Equal Marriage Florida. “We need the backing and support of all of the organizations that have been working on these matters to go forward. … We need their support,” Simpson said. Sheila Kloefkorn, a member of the national board of the Human Rights Campaign (HRC), the nation's largest LGBT rights advocate, said that HRC wasn't prepared to lend its support. “We will not [support the campaign] and I don't know of any organizations that would at this point,” Kloefkorn said. According to The Huffington Post, Mooney, a Republican strategist, in 2004 worked on Utah's campaign to ban gay nuptials and helped put Rick Perry, an opponent of marriage equality, in the Texas Governor's Mansion. “At the end of the day, this is a business for Tim Mooney, and for everyone else involved, it's our lives,” Kloefkorn said. “One of the concerns that activists are always going to have is whether or not an individual has a profit motive and will put their profit above the good strategic best interest of our movement,” Fred Sainz, vice president of communications and marketing at HRC, told The Huffington Post. Activists who have met with Mooney have said that he claims to have had a change of heart since 2004. According to a poll released earlier this year, 55 percent of Arizonans favor marriage equality, while 35 percent remain opposed.